While there are hundreds of various pistol systems out in the world, there are a few universal pointers that everyone can remember to improve their shooting accuracy. However, like anything else in life, the only way you will become an expert is by practice, practice, practice. The first thing that needs to be taken into account is a foundation, in this case, your shooting stance. Personally I shoot with my primary leg back (the side that your shooting hand is on) and my upper body leaning forward. This will allow your body to absorb more of the recoil that results from shooting your pistol-some will have much more than others. Less recoil equals more accurate shooting. Also remember to have both of your arms completely locked out (perfectly straight out in front of you), which will provide for a more stable foundation from which to shoot. The second thing one should pay close attention to is your grip. Do not hold the weapon with a death grip, as this will cause your hands to shake, which will also cause the barrel of your gun to shake, resulting in decreased accuracy. DO NOT, I repeat, DO NOT worry about the gun flying out of your hand. After several hundred hours of training, I never once had the weapon fly from my hands. But, also don't grip the weapon so light as to pretend you're holding a napkin. Use both hands with both thumbs facing forward. This third step might not apply to everyone, which involves proper sight alignment. One should always focus on aligning your sights as to perfectly even and your one front sight to be in between your two rear sights. When shooting, focus on your front sight and DO NOT look at your target. Trust me, point your gun at the target but only focus on your sights and not on the target. Your vision cannot be focused on both the sights being perfect right in front of you and the intended target POINT down range. The next step is to control your breathing. Remember, if you are breathing heavily when you're shooting, your body is moving, which means your hands and weapon follow along. Your aim here is to try and minimize this while pressing the trigger. Some people hold their breaths, while others (such as myself) SLOWLY breath out while slowly pressing the trigger. Your next, and perhaps most important step, is how you press that trigger. Remember, you are pressing the trigger, not pulling it. If you pull a trigger you tend to pull it to the right if you're right handed and pull it left when you're left handed. The focus here is to achieve a surprise break (when the gun goes bang!) You want to be surprised when the gun goes off, as if you never expected the gun to work. 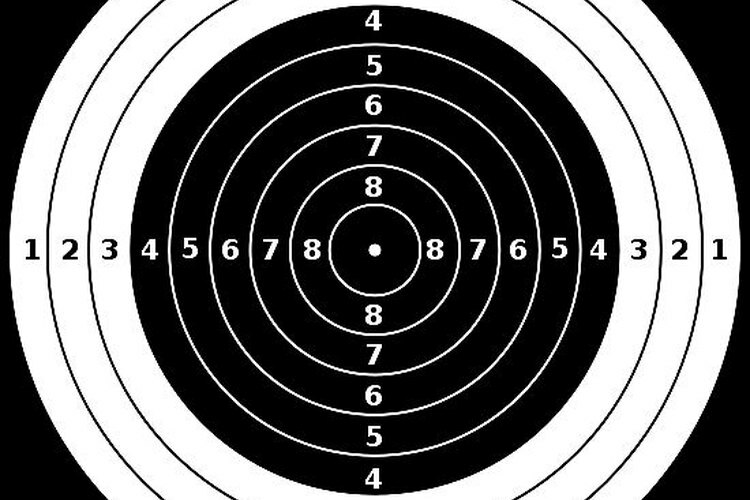 The reason for this is that many people anticipate when the gun will go off, causing them to adjust for the recoil and pointing the gun off target. Trust me, everybody does this, even experts. The trick is to minimize it as much as possible. The next step is to follow through on everything! Don't cut corners or forget any of the steps. Achieving better results requires discipline to the rules. Always remember to clean your gun. A dirty gun will never work as well as a clean gun. Besides, it is embarrassing to have your gun malfunction on you while at the range-or worse, have it not work when you need it! Keep in mind that most people will not become shooting experts in their first, second, or third trip to the range. Like many other things shooting is a perishable skill, and only by practicing will you retain or improve those skills. Remember range safety: All guns are always loaded, never point your weapon at anything you are not willing to destroy, keep your finger off the trigger until your sights are aligned on the target and you intend to shoot, and be sure of your target.